Amazon.com Price: $39.89 (as of 2019-04-18 11:03:36 GMT) Product prices and availability are accurate as of the date/time indicated and are subject to change. Any price and availability information displayed on Amazon.com at the time of purchase will apply to the purchase of this product. Ideal for tournaments, card clubs, or late-night poker games with the buddies, the Fat Cat Hold’em Dealer poker chip set includes everything you need to keep the games flowing. 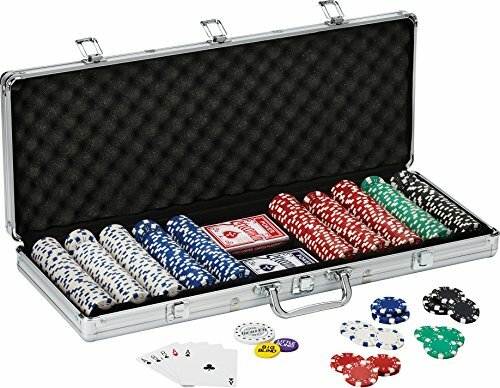 The Hold’em Dealer set comes with 500 11.5-gram striped dice chips–150 white chips, 150 blue chips, 100 red chips, 50 green chips, and 50 black chips–along with a lockable silver aluminum case that holds everything in a single convenient location. Also stored in the case are a pair of card decks and three buttons: big blind, little blind, and dealer. The set makes a handy accessory whether you’re hosting a game at your place or heading to a friend’s house for some poker action.